Imagining (by Giant’s Causeway out of Daydreaming, by A.P. Indy), is a Grade 1-winning product of the historic Phipps Stable breeding operation, and has one of the best stallion’s pedigrees in the stud book. He stands at Anchor & Hope Farm in Maryland. You can see more photos of him here. A Grade 1 winner for the historic Phipps Stable and trainer Shug McGaughey, Imagining has perhaps the best stallion’s pedigree in the stud book. By the Champion racehorse and three-time Leading Sire Giant’s Causeway, who also topped the Juvenile Sire List twice during his stud career, Imagining is one of the no fewer than 178 stakes winners — including 104 Graded/Group winners — sired by Giant’s Causeway at the time of his death earlier in 2018. A son of Storm Cat out of the top-class racemare Mariah’s Storm, Giant’s Causeway has proven himself an influence for precocity as well as classic stamina, on all surfaces, and he had almost thirty sons standing at stud in 2018. Imagining’s female family is no less impressive, as he is a son of the Grade 2-winning A.P. Indy mare Daydreaming, who is a full-sister to Grade 1 winner Girolamo and Grade 3 winner Accelerator (each the sire of Graded winners), as well as to the dams of Kentucky Derby-G1 winner Super Saver and Grade 1 winner Bluegrass Cat (both successful sires), as well as a half-sister to the dam of the Grade 1 winner Got Lucky. Daydreaming’s dam was the Graded winner Get Lucky, a full-sister to Eclipse Champion 2-year-old Rhythm and to the legendary Maryland stallion Not For Love, all of them out of the Grade 1-winning Northern Dancer mare Dance Number. Dance Number was also the dam of Oscillate (by Seattle Slew), in turn the dam of leading Argentinian sire Mutakddim and second dam of the successful young New York stallion Frost Giant. Dance Number herself is a half-sister to Grade 1 winner and successful sire Private Account, as well as to leading Maryland stallion Polish Numbers — their dam being the Champion 2-year-old filly Numbered Account, by Buckpasser. Numbered Account is a full-sister to Playmate, the dam of the successful sire Woodman. Several of those names above are worth noting given that inbreeding within four generations to Dance Number (Imagining’s third dam, who will appear in the fourth generation of his foals) has been an extremely successful strategy, with three stakes winners already from just 37 foals aged 3-and-up bred on that pattern, including two sired by Imagining’s close relative Bluegrass Cat (who is by Imagining’s grandsire Storm Cat, out of a full-sister to Imagining’s dam), and another by Giant’s Causeway’s son Frost Giant (who also shares his third dam with Imagining). Two of those three stakes winners inbred to Dance Number are out of mares by Not For Love, whose daughters are an extremely enticing proposition for Imagining, given not just the success of the “Rasmussen Factor” inbreeding to Dance Number, but also the fact that Not For Love is already the broodmare sire of three stakes winners from just 39 foals of racing age sired by sons of Giant’s Causeway, one of them a Graded winner (and Giant’s Causeway himself has sired a Graded winner out of a Not For Love mare, from just four foals bred on that cross). As a son of Mr. Prospector, Not For Love also demonstrates a more broadly successful cross for Giant’s Causeway and his sons, given that Giant’s Causeway sired 72 stakes winners out of mares by sons and grandsons of Mr. Prospector, while stallions by Giant’s Causeway have already produced a further 87 stakes winners out of daughters of Mr. Prospector’s sons and grandsons. This cross should prove just as successful for Imagining, who will himself only contribute a single cross of Mr. Prospector in the fourth generation of his foals. There are five stakes winners by sons of Giant’s Causeway out of mares by sons of Fappiano (by Mr. Prospector), four of them being Graded/Group winners, suggesting that daughters of Fappiano’s former Maryland son Press Card are worth trying with Imagining. Two of those Graded winners are out of daughters of Cryptoclearance, while Cryptoclearance’s son Victory Gallop is the broodmare sire of five more stakes winners by four different sons of Giant’s Causeway, and Cryptoclearance’s grandson Candy Ride[ARG] is also the broodmare sire of a stakes winner by one of those Giant’s Causeway sons. Candy Ride[ARG] has several young sons at stud, including Sidney’s Candy, Twirling Candy and Red Vine (the latter in Pennsylvania); their daughters should all fit Imagining well (especially given how effective the reverse cross of Candy Ride[ARG]-over-Giant’s Causeway has been). Fappiano is also the grandsire of Pennsylvania sire Real Quiet (by Quiet American), whose son Midnight Lute is now in Kentucky, and Fappiano’s grandson Unbridled’s Song (by Unbridled) is the broodmare sire of four stakes winners (two of them Group winners) by three different Giant’s Causeway stallions, meaning that Unbridled’s Song’s local stallion sons like Domestic Dispute, Eurosilver, Fiber Sonde (currently a leading sire in West Virginia), and Rockport Harbor, would be worth trying as broodmare sires of foals by Imagining, as would Unbridled’s Mid-Atlantic son Unbridled Jet. Carson City is the broodmare sire of six stakes winners by six different sons of Giant’s Causeway, while two of Carson City’s sons are also broodmare sires of stakes winners by sons of Giant’s Causeway, one of those being a Graded winner out of a mare by Pollard’s Vision; this bodes well for Imagining’s chances with mares by Carson City’s regional sire son Hey Chub (in New Jersey) and grandson Windsor Castle (in West Virginia). Woodman (who traces to the same female family as Imagining, as mentioned above) is the broodmare sire of three Graded winners and two more stakes winners by two different sons of Giant’s Causeway, and Woodman’s sons Hawk Wing and Timber Country have between them produced the dams of three stakes winners by three different sons of Giant’s Causeway, one of those a Group 1 winner. This suggests that daughters of former Virginia stallion Hansel (by Woodman), could prove successful with Imagining. While there is just a single Graded winner by a son of Giant’s Causeway for which Gone West appears as the broodmare sire, five different sons of Gone West are broodmare sires of a total of seven stakes winners by seven different sons of Giant’s Causeway, including a pair of Graded winners out of mares by Elusive Quality — who also has a son that is the broodmare sire of a stakes winner by a son of Giant’s Causeway — making fillies by Elusive Quality’s regional sons Great Notion (in Maryland) and Smarty Jones (formerly in Pennsylvania) definitely worth trying with Imagining. Two of those other stakes winners are out of daughters of Grand Slam, whose son Limehouse is one of the leading stallions in West Virginia; his fillies would also be a good fit here. Speightstown is the broodmare sire of a Group 1 winner by a son of Giant’s Causeway, and he has several young sons at stud now as well, including Haynesfield, Munnings and Speightster, plus Despite the Odds in Maryland; all of their daughters would also make sense to try with Imagining. Five sons of Kingmambo are broodmare sires of twelve stakes winners by seven different sons of Giant’s Causeway, including four Graded/Group winners (and Giant’s Causeway himself was the sire of eight stakes winners — three of them Grade/Group 1 winners — from Kingmambo mares). Among those sons of Kingmambo is Lemon Drop Kid, with four stakes winners from his daughters by four different Giant’s Causeway stallions; Lemon Drop Kid’s son Charitable Man was a top sire in West Virginia and his daughters would have to be a good bet with Imagining. Mr. Prospector’s European Champion Machiavellian is the broodmare sire of three stakes winners (two Group winners) by two different sons of Giant’s Causeway, and two of Machiavellian’s sons are the broodmare sires of a further six stakes winners (four Graded/Group winners) by sons of Giant’s Causeway, including four from mares by Street Cry[IRE] by four different sons of Giant’s Causeway (three of them Graded/Group winners), while Street Cry[IRE]’s son Street Sense is also already the broodmare sire of a Group winner by yet another son of Giant’s Causeway. This bodes well for the chances of daughters of the Maryland stallion Street Magician when paired with Imagining, as well as those of Street Cry[IRE]’s other sons New Year’s Day, Street Boss and Street Hero. Sons of Giant’s Causeway have produced a two Graded winners and another stakes winner when paired with mares by Conquistador Cielo and his son Marquetry; Conquistador Cielo’s son Norquestor stood in Maryland, and his daughters should also work well with Imagining. Afleet is the broodmare sire of a Graded winner by a son of Giant’s Causeway, as is Afleet’s son Left Banker, which suggests that daughters of Northern Afleet and his son Afleet Alex, plus that one’s Pennsylvania sire son Dublin, ought to be tried with Imagining. Former Maryland standout Two Punch is the broodmare sire of a stakes winner by a son of Giant’s Causeway; his daughters would make plenty of sense with Imagining, as would those of his son Smoke Glacken. Smart Strike is the broodmare sire of two Graded winners and another stakes winner by three different sons of Giant’s Causeway, and he has several sons at stud now whose daughters would fit Imagining, including Curlin, English Channel and Lookin at Lucky, plus the latter’s Maryland-based son Madefromlucky will have daughters eventually that ought to pair well with Imagining, too. There are two stakes winners by sons of Giant’s Causeway out of daughters of Seeking the Gold (plus Seeking the Gold’s daughters produced no fewer than four Grade 1 winners when mated with Giant’s Causeway himself), and that one’s son Petionville is now in Maryland and already proven as a broodmare sire; his daughters ought to work with Imagining, as should those of the former West Virginia stallion Black Tie Affair[IRE], whose sire Miswaki is the broodmare sire of a stakes winner by a son of Giant’s Causeway (and of three stakes winners, including one Grade 1 and another Graded winner, by Giant’s Causeway himself). Four different sons of Forty Niner are broodmare sires of stakes winners by sons of Giant’s Causeway, which suggests that daughters of Distorted Humor ought to fit nicely with Imagining; that one has several young sons at stud, as well, whose fillies could work here, including the Pennsylvania sires Cal Nation and Got the Last Laugh, plus Alternation, Jimmy Creed and Maclean’s Music in Kentucky. A daughter of Kentucky Derby-G1 winner Fusaichi Pegasus produced a stakes winner by a son of Giant’s Causeway, while Fusaichi Pegasus’s son Roman Ruler is the broodmare sire of two stakes winners by two more of Giant’s Causeway’s sons; mares by either of those two could pair well with Imagining, as could those by the Kentucky Derby-G1 winner Thunder Gulch, who is already the broodmare sire of three stakes winners by three different sons of Giant’s Causeway, while a daughter of Golden Gear (like Thunder Gulch, a son of Gulch) also got a Graded winner by a son of Giant’s Causeway. Other sons of Mr. Prospector who sired the dams of stakes winners by sons of Giant’s Causeway include Chester House, Gold Token, Jade Hunter, Mining, Numerous and Silver Ghost, while other Mid-Atlantic sons of Mr. Prospector whose daughters could be tried with Imagining would include Allen’s Prospect, E Dubai and Mojave Moon. Like the inbreeding to Dance Number discussed above, duplicating Numbered Account within four generations has also been a successful pattern (though since Numbered Account is Imagining’s fourth dam, she will appear in the fifth generation of his foals), and the former Maryland stalwart Polish Numbers provides a very tempting source of Numbered Account to try with Imagining, as there is already a stakes winner from just 20 foals of racing age by sons of Giant’s Causeway out of dams by Polish Numbers (and another stakes winner from only three foals by Giant’s Causeway himself with Polish Numbers as the broodmare sire). Polish Numbers is a son of Danzig (by Northern Dancer), and this represents the other most productive cross for Giant’s Causeway’s sons, as there are 21 stakes winners by such sires out of mares by sons of Danzig, and 19 more stakes winners out of mares by grandsons of Danzig — 22 of those 40 total stakes winners being Graded/Group winners. In addition to Polish Numbers, other sons of Danzig who are already broodmare sires of stakes winners by sons of Giant’s Causeway include Langfuhr (with two such stakes winners; he is the sire of Lawyer Ron, whose daughters would also work here), Belong to Me (whose son, Lucky Roberto, is also the broodmare sire of a Group winner by a son of Giant’s Causeway), Boundary (sire of Big Brown, now in New York and whose daughters would fit Imagining, as will those of Big Brown’s Maryland son Dortmund, eventually), Dayjur, and Hard Spun. The strong results that sons of Giant’s Causeway have achieved with Danzig-line mares suggests that daughters of the local stallions Outflanker, Partner’s Hero and Rimrod (all by Danzig) should be tried with Imagining, along with those of Weigelia (a grandson of Danzig who is a top sire in Pennsylvania). There are two stakes winners by sons of Giant’s Causeway out of mares by sons of Dixieland Band, including a Grade 1 winner with a Dixie Union dam, and one out of a mare by Dixie Brass. This makes mares by former leading Maryland sire Citidancer (by Dixieland Band) appealing here, along with those by his regional sire sons Cherokee’s Boy, Disco Rico and Park Avenue Ball. Another Northern Dancer-line stallion whose female descendants have worked well with sons of Giant’s Causeway is Deputy Minister, who is himself the broodmare sire of a stakes winner by a Giant’s Causeway son, while six of Deputy Minister’s sons are the broodmare sires of eight total stakes winners (half of them Graded/Group winners) by seven different such sires; there is also a Deputy Minister grandson that is the broodmare sire of a stakes winner by a Giant’s Causeway stallion. Among the Deputy Minister sons who have had success on this pattern are Awesome Again (broodmare sire of two such stakes winners and also the sire of Ghostzapper; both of their daughters would be worth trying here, especially given the success of the reverse, Ghostzapper-over-Storm Cat cross), Dehere (broodmare sire of two such stakes winners; his full-brother Defrere was a longtime leading sire in New Jersey, and both of their daughters ought to be tried with Imagining), Silver Deputy (whose sons at stud include Posse and Badge of Silver), and Touch Gold (the sire of Pennsylvania stallion Medallist). Other local sources of Deputy Minister whose fillies should work with Imagining include Ghostly Minister, Talk Is Money and Yarrow Brae. The daughters of Sadler’s Wells (by Northern Dancer) and his sons have proven very successful with sons of Giant’s Causeway, accounting for 21 stakes winners by six different such sires (including one out of a mare by Sligo Bay[IRE], who stands in North America, and six out of mares by Galileo[IRE] (two of them Grade/Group 1 winners), whose son Seville[GER] stood in Maryland prior to his death and whose fillies should fit nicely with Imagining). Grandsons of Sadler’s Wells are the broodmare sires of four more stakes winners, one out of a mare by Kitten’s Joy and sired by a seventh son of Giant’s Causeway. The other main branch of Sadler’s Wells available in North America also comes through Kitten’s Joy’s sire El Prado[IRE], namely that of Medaglia d’Oro, who has several young sons at stud now, too, including Golden Lad in Maryland. Given the above results with mares by Northern Dancer-line stallions, and noting that former Maryland sire Fairbanks (by Giant’s Causeway) produced his best runner out of a mare by Northern Dancer’s grandson Opening Verse, daughters of Preakness-G1 winner and former Maryland sire Louis Quatorze (by Sovereign Dancer) could also be tried with Imagining. A final Northern Dancer-line to consider with Imagining is that of Storm Cat, who is the grandsire of Imagining himself, and while anecdotal evidence would suggest that inbreeding to Storm Cat might be a negative, the statistics do not necessarily back that up — especially in the case of breeding sons of Giant’s Causeway to mares by grandsons of Storm Cat, a pattern which has already produced three stakes winners by three different Giant’s Causeway sons out of mares by Harlan’s Holiday (sire of Into Mischief and Shanghai Bobby, both of whom will have daughters that could be tried with Imagining), Henny Hughes (a son of Hennessy, like the Pennsylvania stallion Wiseman’s Ferry, whose fillies could work with Imagining) and Old Forester. Former regional sire Sir Cat (a son of Storm Cat), is also the broodmare sire of a Graded winner by a son of Giant’s Causeway. Mares from the Damascus sire-line have had success when mated with sons of Giant’s Causeway. Private Account (as mentioned above, a half-brother to Imagining’s third dam, Dance Number), is the broodmare sire of a stakes winner by a son of Giant’s Causeway, as are his sons Unaccounted For (broodmare sire of a Grade 1 winner on this cross) and Valley Crossing, who stood in the Mid-Atlantic. Their daughters are thus worth trying with Imagining, as are mares by Private Account’s son Private Terms, who also stood at stud locally. Another Damascus son, Eastern Echo, is the broodmare sire of a stakes winner by a son of Giant’s Causeway, making mares by his West Virginia son Swiss Yodeler worth trying here, too, while Damascus’s grandson Gilded Time is also the broodmare sire of a stakes winner by a son of Giant’s Causeway. 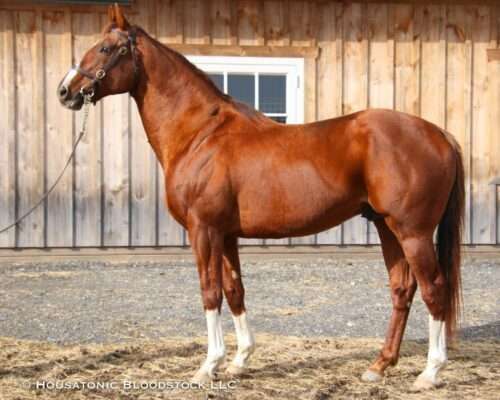 Hail To Reason-line mares have had considerable success when mated with sons of Giant’s Causeway, including stakes winners out of mares by each of Devil’s Bag and Saint Ballado (who are both by Halo and, interestingly, are full-brothers to Glorious Song, the dam of Giant’s Causeway’s broodmare sire Rahy). Saint Ballado’s son Yankee Victor is also the broodmare sire of a stakes winner by a son of Giant’s Causeway, as is Halo’s son Halo’s Image, while a daughter of another Halo son, Southern Halo, is the dam of a Graded winner by a son of Giant’s Causeway. Southern Halo is also the sire of More Than Ready, in turn the broodmare sire of a Group 1 winner and another stakes winner by two different sons of Giant’s Causeway. The other main branch of Hail To Reason, along with that of Halo, belongs to Roberto, whose sons Dynaformer, Red Ransom and Sunshine Forever are between them responsible for the dams of five stakes winners by four different sons of Giant’s Causeway, while two grandsons of Roberto are also broodmare sires of stakes winners by Giant’s Causeway stallions, including Dr. Fong, a son of Kris S., who is also the sire of the former West Virginia stallion Prized, as well as of Arch, in turn the sire of Archarcharch and Blame; mares by any of these could make plenty of sense with Imagining. There is also a stakes winner by a son of Giant’s Causeway from a mare by New York stallion Take Me Out, he a son of Cure the Blues (by Stop the Music, a son of Hail To Reason). Blushing Groom[FR]-line mares have produced no fewer than six stakes winners (four of them Graded/Group winners) by six different sons of Giant’s Causeway. West Virginia sire During (by Cherokee Run, a grandson of Blushing Groom[FR]) is already the broodmare sire of a stakes winner on this cross, so his daughters should work well with Imagining. The New York stallion Congaree is one of two sons of Arazi who are the broodmare sires of Graded/Group winners by sons of Giant’s Causeway; Arazi, in turn, is by Rahy, whose son Bop stood in West Virginia and whose fillies could be a good fit here, as could those of the Maryland stallion Orientate, a son of Mt. Livermore (by Blushing Groom[FR]). Six different sons of Giant’s Causeway have produced stakes winners from mares by five different In Reality-line stallions, including one by Cee’s Tizzy and another by his son Tiznow, who has a son in Maryland (Bullsbay), whose daughters should work well with Imagining (especially given the success of the reverse, Tiznow-over-Storm Cat cross). Valid Expectations is also the broodmare sire of a stakes winner by a Giant’s Causeway stallion; he is a son of Valid Appeal, as is Successful Appeal; their daughters could fit well here. Daughters of Indian Charlie have produced a Graded winner and another stakes winner by two different sons of Giant’s Causeway; Indian Charlie is the sire of Uncle Mo, who has several young sons at stud now, and their daughters would be worth trying with Imagining. Indian Charlie, in turn, is a son of In Excess[IRE], who has also sired Gibson County, the broodmare sire of a stakes winner by another son of Giant’s Causeway. In Excess[IRE] is a grandson of Caro[IRE], whose son Cozzene sired Running Stag, he the broodmare sire of a stakes winner by a son of Giant’s Causeway. Cozzene’s other sons include Alphabet Soup and Mizzen Mast, whose daughters could be interesting here. Maria’s Mon (a son of Wavering Monarch, by Majestic Light) has thrown the dams of three stakes winners by two different sons of Giant’s Causeway, one of them being a Grade 1 winner. Maria’s Mon has sired a pair of Kentucky Derby-G1 winners, Monarchos and Super Saver, whose daughters would be worth a try with Imagining, especially as the latter is out of a full-sister to Imagining’s dam and thus would result in some interesting inbreeding. Wild Again and his son Wild Rush are each the broodmare sires of a stakes winner by two different sons of Giant’s Causeway, making daughters of the Pennsylvania sire Offlee Wild worth trying with Imagining. Wild Again is a son of Icecapade, who also sired Clever Trick, in turn the sire of Phone Trick, whose son Intidab is the broodmare sire of a stakes winner by Giant’s Causeway. Is It True (by Raja Baba) is the sire of a Graded winner by a son of Giant’s Causeway, making daughters of his son Yes It’s True worth trying with Imagining, as are mares by Pennsylvania’s Formal Dinner (a grandson of Raja Baba by Well Decorated). Six different sons of Giant’s Causeway have produced six stakes winners (a pair of them Graded winners) out of mares by six different sons of A.P. Indy, and there are loads of A.P. Indy-line mares in the Mid-Atlantic, like Buffum, Corinthian, Freedom Child, Friesan Fire, Jump Start, Malibu Moon, Oratory, Rock Slide (a full-brother to Mineshaft, the broodmare sire of a Graded winner by a son of Giant’s Causeway), Scipion, Silver Train and Super Ninety Nine. Although inbreeding to A.P. Indy (Imagining being out of a mare by A.P. Indy) has not proven particularly productive yet, one of the dozen stakes winners that is inbred to him in the third and fourth generations is sired by Imagining’s close relative Bluegrass Cat, so it could work here. Inbreeding to Seattle Slew (sire of A.P. Indy) has been more effective than to A.P. Indy, including six stakes winners with such a pattern by Bluegrass Cat, three more by another son of Giant’s Causeway who is closely-related to Imagining in Frost Giant, and another three by yet another son of Giant’s Causeway. This makes daughters of Capote (and his son Boston Harbor) and Vindication potentially intriguing here.